I have started a Visual Journal and as often as possible I am going to make a page and blog it, by the end of the year I hope I will have a book full of ideas, layouts, quotes, colour palettes and further design inspiration. The first page can be found here and certainly got me started on making a ‘quick’ (well quick for me) visual collage and I certainly had to push myself into working without a plan. 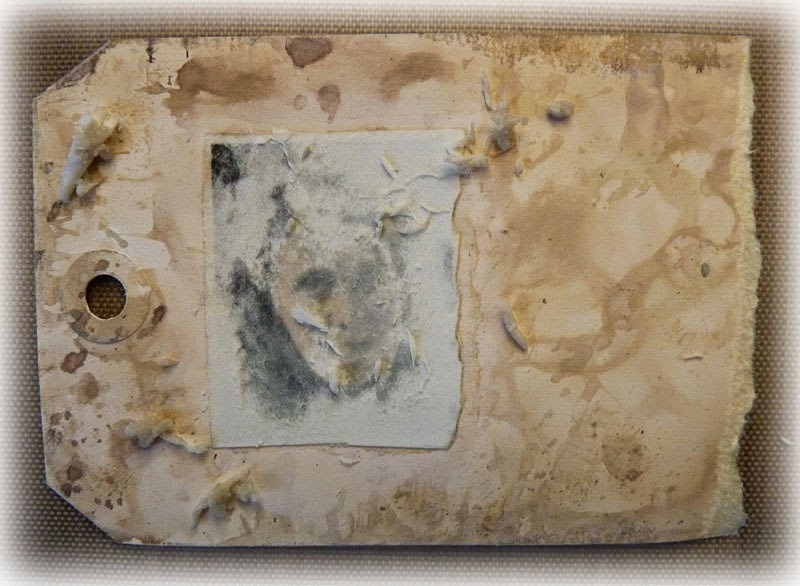 I haven't entered any challenges for a long time and have decided to 'keep an eye' on a few that I know will provide me with inspiration and challenging themes that will get me back into thinking about new ideas and help me explore and practice alternative and perhaps unfamiliar ways of approaching my art. 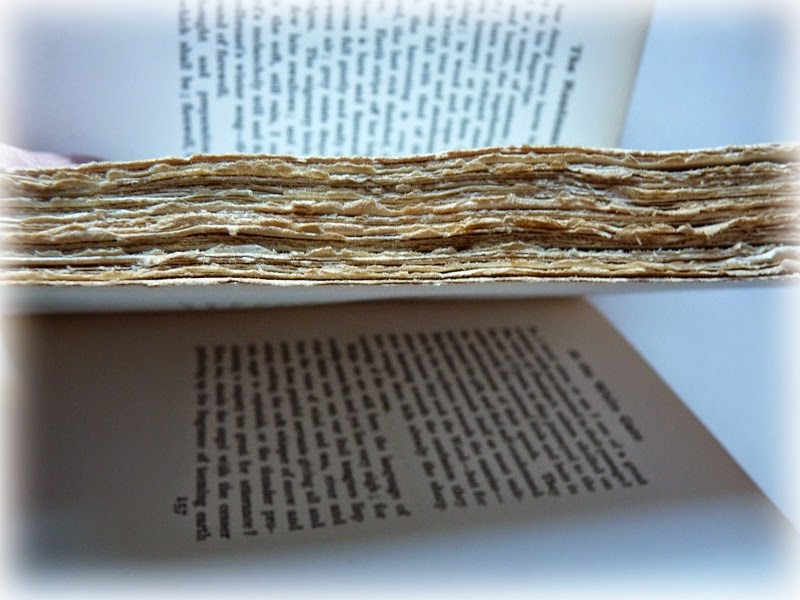 The changes at PaperArtsy certainly look exciting and I will enter this altered book with it's 'fragile' pages there. So I have another double page spread for you. 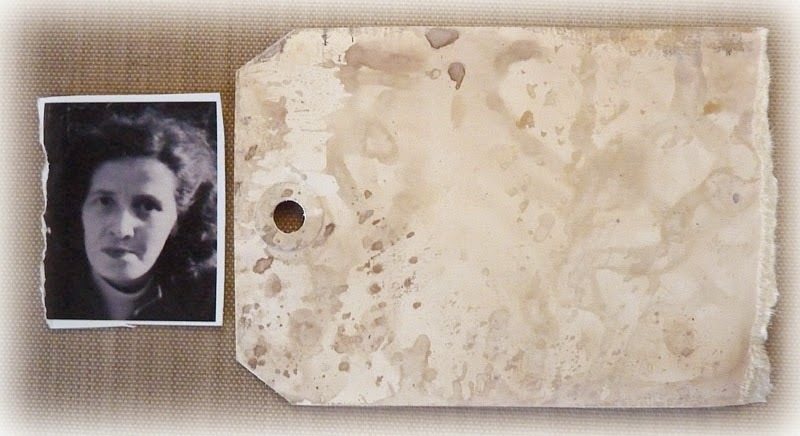 This week I wanted to try out a photo transfer technique and began with two tags and a photo of my daughter as a baby and one of my Mum as a young woman. 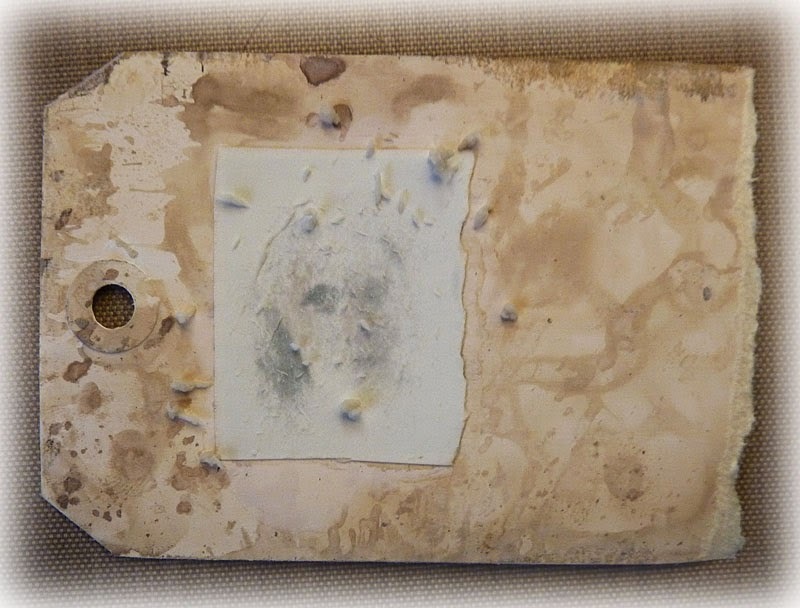 I had researched techniques and decided to go with one I had found using mod podge. 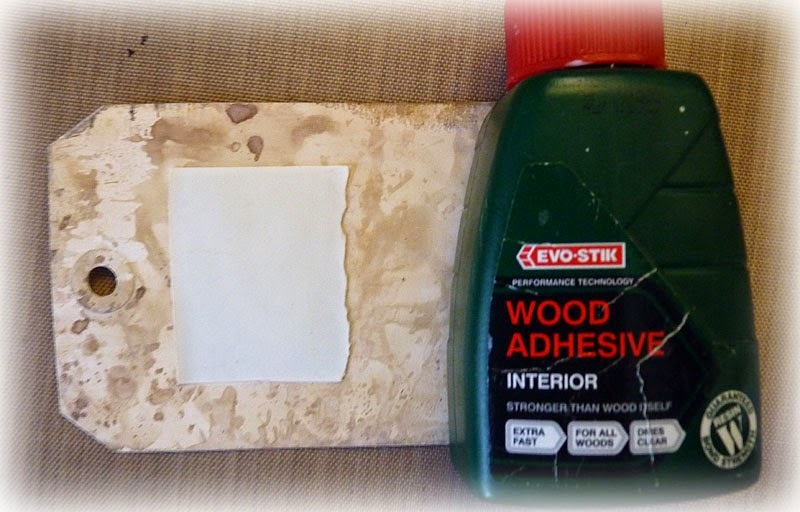 But my favourite wet glue is Evo-stik wood adhesive so I experimented with that instead. Many of the tutorials you find say you can only use laser prints but I used my trusty inkjet printer and a thin photographic paper. 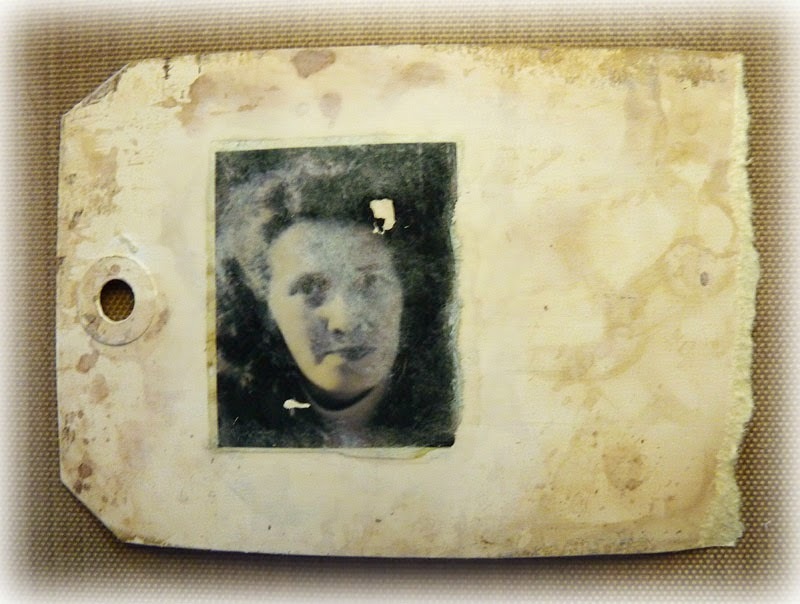 When the photo was dry I adhered it to the distressed tag (face down) and dried it with my heat gun. I also let it cool and left if for about half an hour to ensure it was dry. 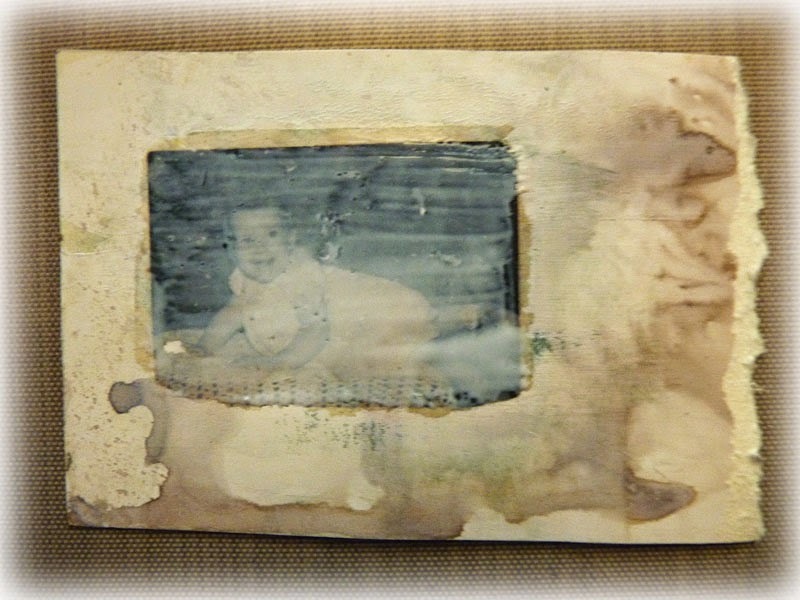 Using some warm water I began to gently rub it into the back of the photo so that the paper rubbed away and slowly the image began to appear. I continued to do this until I could see the image clearly. 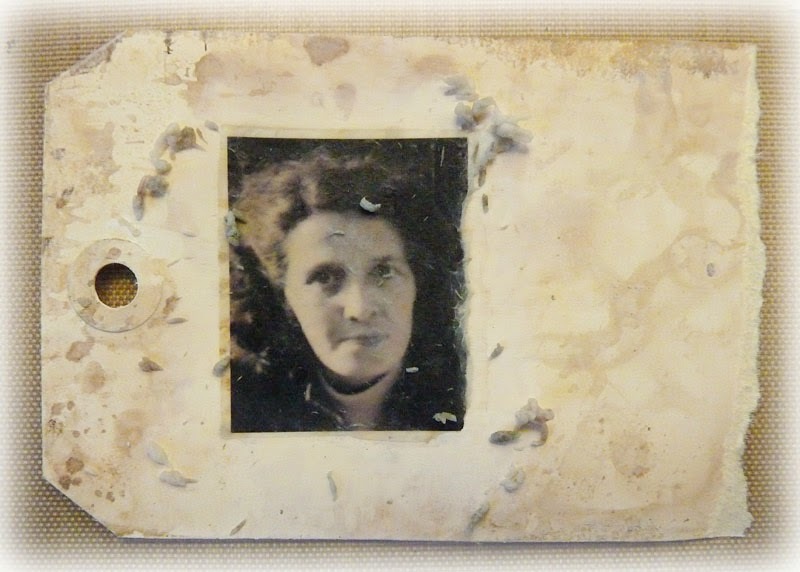 I gave Maddie’s photo a sealing layer of the wood glue …..
….. but not with my Mum’s photo as I wanted to see the differences. I actually prefer the matte finish to the shiny finish from the glue. I gathered some collage pieces, tissue wrap, tissue tapes, scraps of papers and borders and started to glue them down. I have to admit I did spend some ‘thinking’ time on this one but not too much, just enough to plan the butterfly in the film strip and to find the letters and numbers I wanted to add. So there we have it my second go at creating a collage and this time with trying out a new technique as well. I have to say I am rather pleased with it. Thank you to Nikki, Alison, Sue and Mona for joining my blog hop and sharing your journal pages with me. You can see their contributions below as part of the link-up. I would love it if you joined in as well. I am deciding whether I keep each linky open for 2 weeks or a month, let’s see what happens before I make the decision. So it’s ‘anything goes’ with whatever journal/sketchbook/ type activity is right for you. This is the code to add to your post so you can share the Link Up with your readers. Please join our Visual Journal Link Up and thank you for sharing your inspiration with us. Another double page which looks fabulous, I never have much luck with transferring images, yours have come out wonderfully. I like the added string to connect your images also. Mine is coming along, I have been placing my wastes on my pages to create a Bg. Watch this space! Fragile Papers is the Challenge over at Paper Artsy at the moment, your pages would qualify and they are most beautiful colours and collaging i have seen in a while. Thank you for the wood glue tip, i shall try that as i rarely have success with image transfers. 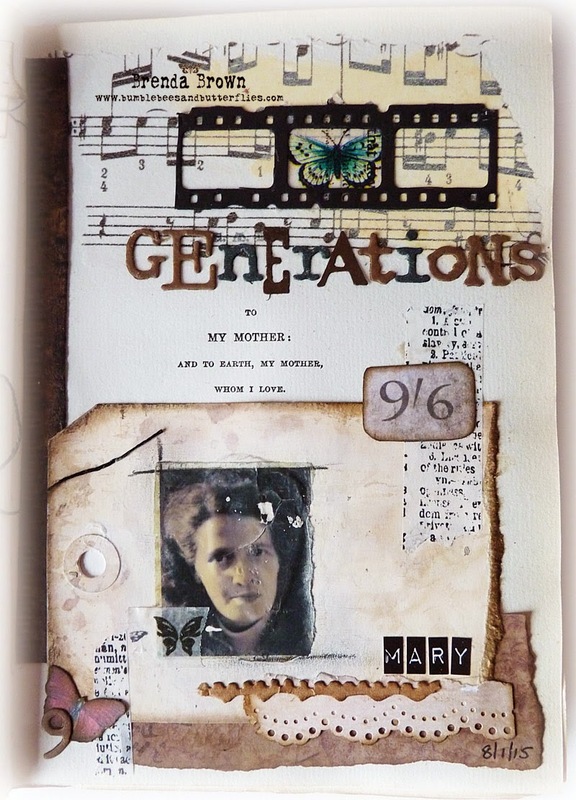 Gorgeous journaling Brenda...great combination of details and beautiful family photos...keep going, I want to see more! Another fabulous spread Brenda, and your photo transfers have worked out stunningly well! Brenda, this journal is going to be awesome when finished, looking forward to watching it all come together throughout the year. This isn't simply beautiful to look at but it is beautiful because there is a wonderful tenderness from the photographs you included. Such a lovely post to visit. Brilliant! Your photos transferred so well! That's outstanding, just a wonderful project. Your journal pages are really lovely in every detail. The beautiful transfers you made are a wonderful addition and set a sweet scene! awe struck! 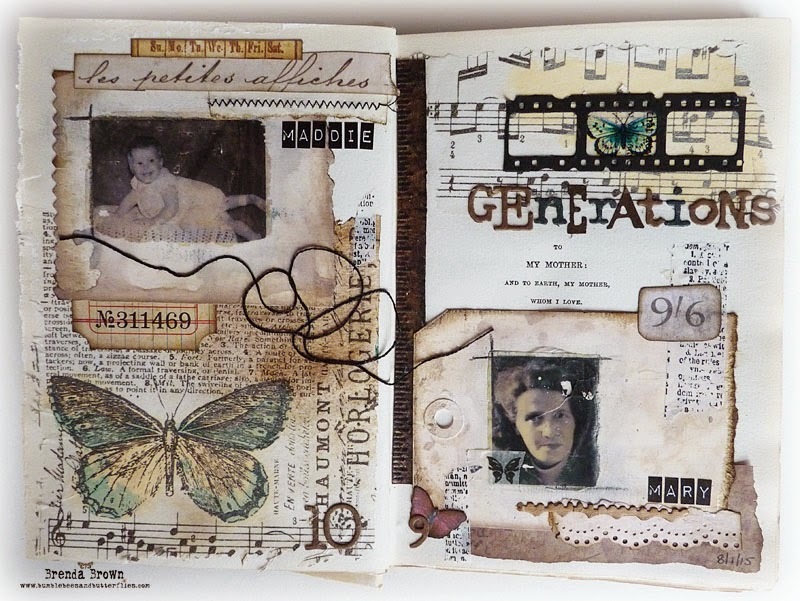 I would love to make journal pages such as these! 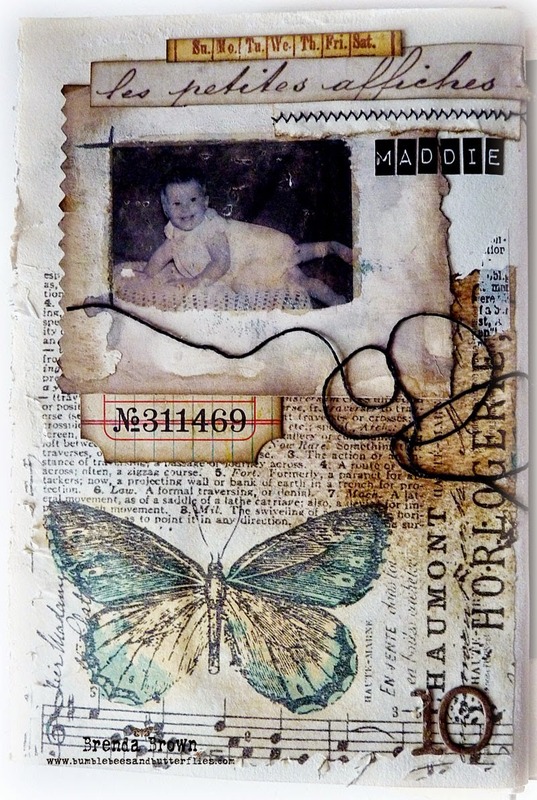 I'd like to join the blog hop ... but my journal pages aren't vintage looking and they aren't in an altered book. Does that matter? Wow Brenda! So fabulous! What a cool transfer technique! Your project is beautiful! Love the pretty butterflies! Thanks for the inspiration! I don't know how to share the inlinkz on my post, so if you don't mind emailing me the instructions, I would be happy to do so :) Thanks! 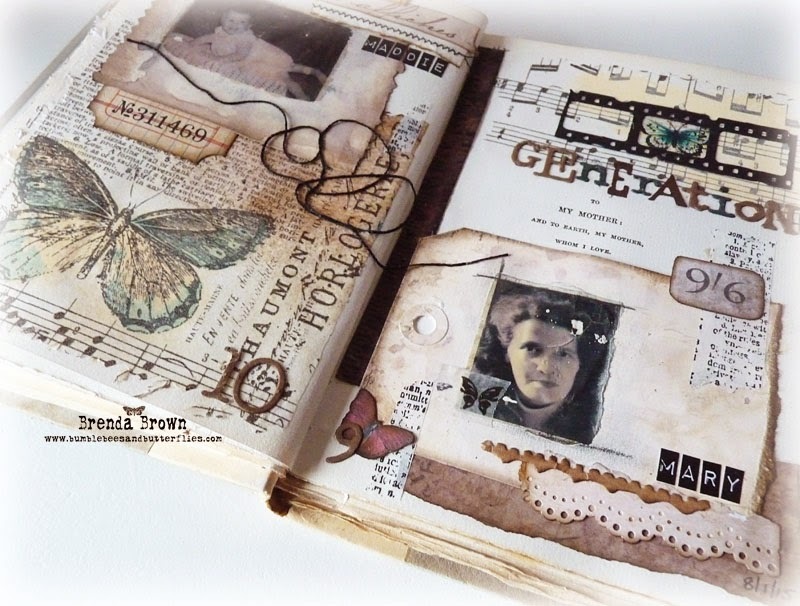 Fabulous pages - love the photo transfers, and interesting that you used an ink-jet. I may just join in Brenda in a bit when I can get my mind straight! I love what you have created and the entire idea! Hugs!